Newly redesigned ASMFC Cooperative Tagging Website has launched! The purpose of this website is to promote communication and coordination between researchers, tagging programs, and the general public, and to ensure that the programs are successful and the best tagging practices are used. There are a number of different features and sections of the website, accessible from the links at the top of the page. 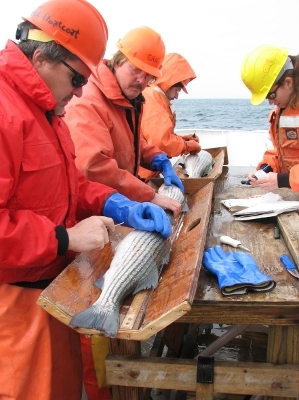 While the long running Cooperative Winter Tagging Cruise was not able to conduct a full research vessel, trawl-based cruise this year due to lack of funding, it was able to conduct striped bass tagging operations with the help of its state and federal partners. Historically funded by NOAA Fisheries (through use of one of its survey vessels, or provision of charter funds) and supported with in kind contributions from the U.S. Fish and Wildlife (USFWS), the Commission, Maryland DNR-Fisheries Service, NC Division of Marine Fisheries (NC DMF)and numerous additional state fishery agencies and universities, the Tagging Cruise provides important data for the striped bass stock assessment, as well as other ASMFC species. In order to keep the striped bass time series intact, all the partners worked together, with the assistance of additional partners -- Paul Caruso, Massachusetts Division of Marine Fisheries, who coordinates the Massachusetts component of the cooperative coastwide striped bass program, and Randy Gregory, NC DMF, who coordinated the North Carolina dolphinfish tagging program -- to implement a cruise in 2011. Thanks to NC DMF, USFWS was able to charter a sportfishing vessel for one day to conduct tagging operations using hook and line. The necessary permits were issued by the Virginia Marine Resources Commission, and the National Marine Fisheries Service Southeast Region. A total of 108 striped bass were tagged. An additional trip was scheduled, but was aborted due to adverse weather. Tagging cruise partners are working together to secure future long-term funding to continue conducting the cruise using a federal research vessel and the traditional trawl gear. Use of this gear has proven not only efficient, but also enables the collection of data on multiple Commission-managed species, including Atlantic sturgeon, spiny dogfish weakfish, summer flounder and alosine species, such as shad and river herring. 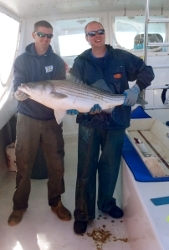 Collection of the fish via hook and line provides data only for striped bass. For more information about the Tagging Cruise, please contact Wilson Laney, USFWS, at (919) 515-5019 or wilson_laney@fws.gov. Technical difficulties delayed the start of the cruise this year, but once underway, the cruise was a success. Researchers tagged striped bass (right), sturgeon, and spiny dogfish, and measured and counted a number of other species, including river herring, skates, and weakfish. This cruise has been going on since 1988. For questions about fish tagging on freshwater, contact your state agency.